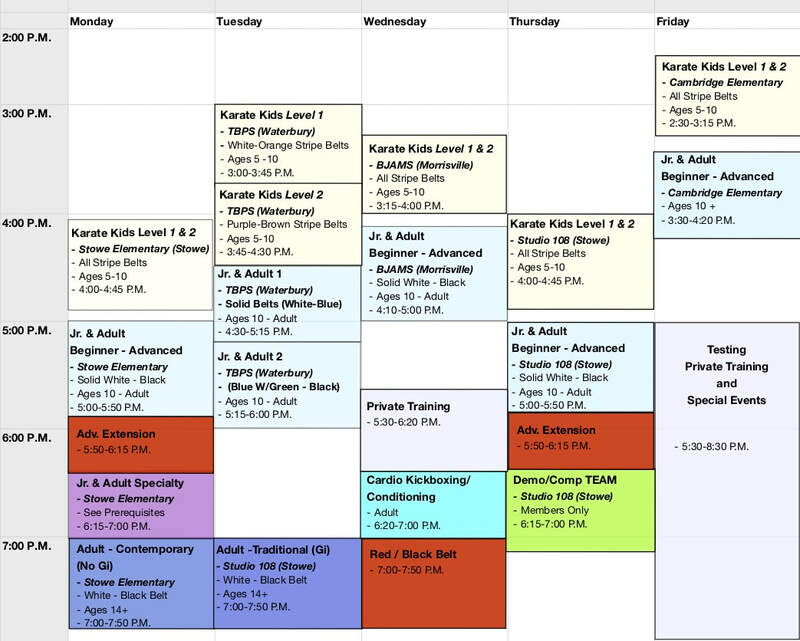 The Karate Kids Program is designed specifically for children ages 5 through 10. The emphasis is on gross motor skills and activities that are developmentally and age appropriate. Students engage in physical activities that work on balance, coordination, fitness, flexibility, speed, timing, and power skills, along with traditional martial arts movements. Mount Mansfield Martial Arts students understand that the goal of self-defense is to prevent harm, not hurt others. We emphasize that our program uses martial arts techniques to teach social skills such as cooperation, taking turns, sharing, listening, and teamwork. Through training, students work on goal setting and achievement by progressing through our curriculum and obtaining colored belts and stripes. We also integrate a character development program into our classes that reinforces respect, self-control, self-discipline, focus, courtesy, integrity and confidence. Through positive feedback, overcoming challenges, mastering responsibilities and achieving goals, students at Mount Mansfield Martial Arts can become the leaders of tomorrow. This class follows the Adult Solid Belt system (Turning 10 and already a stripe belt? Don’t worry, the belts match up real easily. The Stripe Belts are just divisions of our Solid Belts). The class is faster paced and more technically and physically challenging than our Karate Kids program. While the emphasis is primarily traditional martial arts students also delve into Wude (Martial Ethics), modern Self-Defense and physical conditioning. Most importantly, it is still fun. This class is also a great opportunity for the whole family to train together. Ages range from those Karate Kids who have graduated to Solid Purple through Teens (also adults that are taking the class with their children).